Mars and I live in what is commonly called an "old established neighborhood". This time of year it is normally busy with the sounds of lawns and gardens being raked and children playing. But for the past week or so the air has been thick with the sounds of new homes being built. Our little area began in the 1920's as part of a planned development called "Brimfield Gardens". 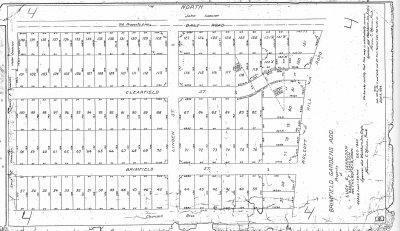 The first map of the site was filed with the Wethersfield Town Clerk on December 14th, 1921 -- one-hundred-forty neatly numbered lots, the majority of them 50' by 140'. Our street's portion is comprised of lot numbers 37 through 78. Thirty-four residences were constructed on those parcels of land between 1924 and 1952 -- a lesser number, but larger houses and properties than was called for by the original proposal. Most are small colonial style, including ours, which sits on portions of parcels 50, 51, and 52. Brimfield Gardens, per se, never happened. Although considered a neighborhood of starter homes in some quarters, most of the "starters" who buy them seem to stay. As a result our street has, for a long time, been made up of a relatively even distribution of young marrieds with young children, about-to-be empty nesters, empty nesters, and retirees. Over the years enough people have progressed through the ranks, exited at the high end, and entered at the beginning, to keep the ratio pretty constant. The wildlife population, in contrast, has been just as steady in numbers, but much more transient in its membership. We were quite excited when we noticed the smallish woodpecker banging his beak into the bark of our flowering crab. Because of its size, but mostly because of its location, that tree is our primary viewing site for front yard wildlife. We hang our bird feeders there. And we maintain bushes around the tree to provide safe cover for all of the avifauna that drops by for the seed and the suet. For years birds have come for the "and board" but none have ever expressed interest in a room at our flowering crab condos -- or anywhere else on our property for that matter. Several years ago we purchased a bluebird house. It was part of a program to attract the species back within the borders of Connecticut. The instructions said to place the presumptive nest holder three to six feet high in a woodland clearing among scattered trees. We have the latter but not the former. So instead we picked the tree on our property that was furthest away from our house -- an elm -- and mounted it there. Unfortunately that meant we could not see the bird motel from any indoor location. And only from one or two outdoors spots -- both within reaching distance of the 4" by 4" by 9" structure. 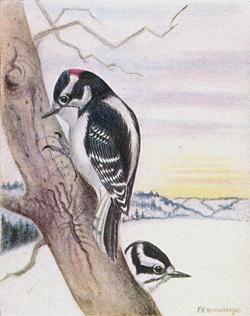 The write-up also said to monitor the dwelling place for intruders such as chickadees, titmice, wrens, and nuthatches. We did, for a short while. Then, there being no apparent action and it being in the largely invisible part of our property, we pretty much stopped checking. 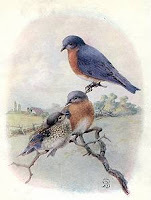 We never did see any bluebirds. One time, when I was in that neck of the woods for other reasons, I happened to glance into the bird box and discovered the rudimentary beginnings of a small nest. I decided to leave it there, reasoning that even though the likelihood of it belonging to a bluebird was pretty much nil (none having been seen locally except in our bird book), whoever the builder was, they likely needed it. I continued checking, but no one ever showed. So after a few weeks I cleaned it out and quickly forgot about it. This vignette was repeated several times over the next several years. Meanwhile the infrastructure of the domicile was rapidly declining. I took it down and tossed it just moments before it achieved full eyesore status. We had a similar experience with a butterfly house that our son gave us for a garden we had just planted to attract these large-winged, colorful insects. The Lepidoptera living quarters were intended more as a one-night-stand than a month-to-month rental. It consisted of an enclosed rectangular box about 30" x 6", the long sides of which contained slots intended to emulate the indentations in the bark of trees wherein butterflies would nestle down and spend the evening. Philandering was encouraged, and actually hoped for. This housing unit was within sight and earshot of our bedroom window. I never saw any Lepidoptera land there, nor did I hear any little lepidopterous lust songs during the overnight hours. In time it also deteriorated and departed ingloriously. Now, a new armada of woodpecker homebuilders has descended upon our little corner of the world. They work from dawn to dusk, weekdays and weekends, pounding their chisel-like beaks into the middle-aged oak and maple trees that predominate in the area. Most of the noise seems to come from pretty high up, so I suspect that the tenants that ultimately occupy these exclusive penthouses will spend much of their time well above the day-to-day neighborhood fray. And as a result will remain largely invisible to most of us living down at street level. Nonetheless they will still be an integral part of the community. Homes, trees, and long-time residents give a neighborhood its character. But new blood gives it its soul.